The Naval Air Warfare Center, Aircraft Division Industry Day, hosted by The Patuxent Partnership, is set for April 5, 2018, from 8 am to 5 pm at the Southern Maryland Higher Education Center. The agenda is still forthcoming, but the tentative schedule includes various topics of interest from 8 to 10 am, then one-on-ones from 10 am to 5 pm. Sign-up for the one-on-ones are available on the registration website. Register now on the TPP website. Registration is free to all attendees and acquisition workforce attendees can earn four CL points. Workforce attendees should be logged manually into eDACM. Informational Industry Days are an effective way to enhance communication between the government and supporting industries. 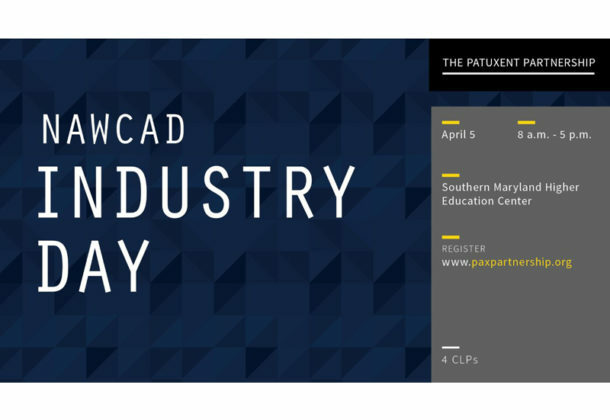 All parties can take the opportunity to conduct market research and increase their competitive edge in support of NAWCAD Pax. Learn valuable information about what NAWCAD needs, prospective contract requirements, and small business emphasis areas. The Industry Day will take place at the Southern Maryland Higher Education Center, which is located at 44219 Airport Road in California, Md. It’s hard to ignore the buzz about how advances with autonomous capabilities are extending the limits of human capability – right down to our daily lives. Bringing together leaders, decision-makers, and subject-matter experts from government, industry, and academia, The Patuxent Partnership is hosting a one-day conference designed to address the major issues in autonomous systems technology, “Is Autonomy the New Cyber?” The program will be held March 21 from 8 am to 4:30 pm at the Southern Maryland Higher Education Center. The program will be immediately followed by a demonstration at the University of Maryland Unmanned Aircraft Systems Test Site, next door to the SMHEC at the St. Mary’s County Regional Airport complex. Registration is open online through March 19; walk-in registrations will be accepted as space is available. Click here to register. TPP fosters collaboration and the sharing of knowledge and expertise across a diverse network that includes government, industry, and academia. TPP also supports STEM education and workforce development within the local community including hosting programs of interest to NAVAIR, NAWCAD, and the broader DoD community.